I feel so trendy. I downloaded the pdf of one of those trendy indie patterns, and bought trendy cotton fabric from a very trendy little store with trendy high prices (but for which I had a gift card). The pants are Named Alexandria Pegs. I saw them on another blogger’s site. She had made them out of olive green twill, and they looked great. Then I went to Pattern Review and to Named’s website to see other versions. I can’t say I was impressed. This, I suppose, is how Indie pattern makers get clients — through bloggers who try them out in some version or fabric that speaks to someone, somewhere. Olive green happens to be my favourite colour for pants (I have about six pairs in that colour). That may have contributed to my falling in love with them. Also the blogger, whose name I can’t recall, was very tall. With long legs. She looked terrific, and actually looks terrific in anything she makes. I have to say I don’t think I made a mistake in a sudden fit of infatuation (I bought the pant pattern within 30 minutes of seeing the pants on the other blogger). I didn’t have fabric to suit them, but had a two-year-old giftcard that I wanted to use up. I liked the look of the fabric, and liked it in all their colours. But I could have wished it was a little more heavy duty. This is a lightweight fabric, without much body. They are perfect for warm weather, but if I want these pants in the colder weather, I’ll have to make another pair. Here they are, my tomato-red peggies. You can see that the interesting thing about them is that they have a pair of pleats, one of which extends over the edge of the pocket. 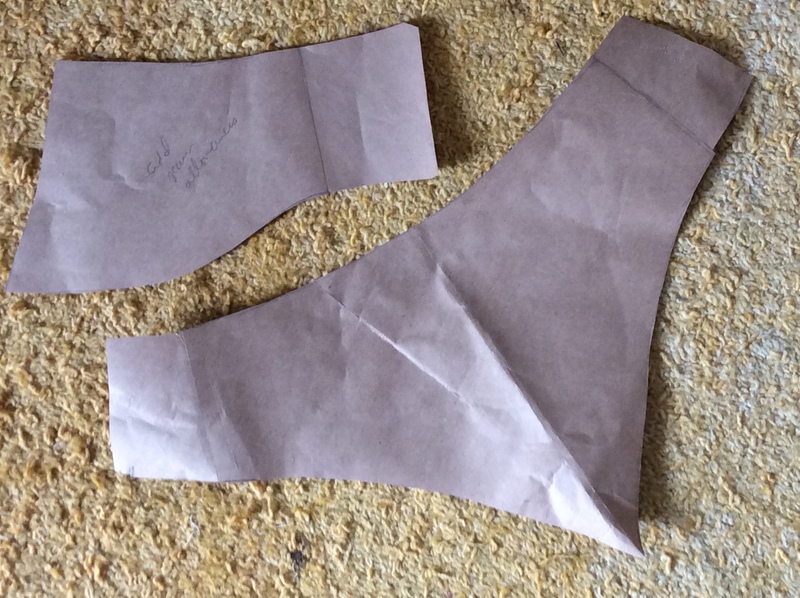 I traced the size 8, but became alarmed when I read that the included seam allowance was only 3/8″. My hip measurement is closer to the size 10. 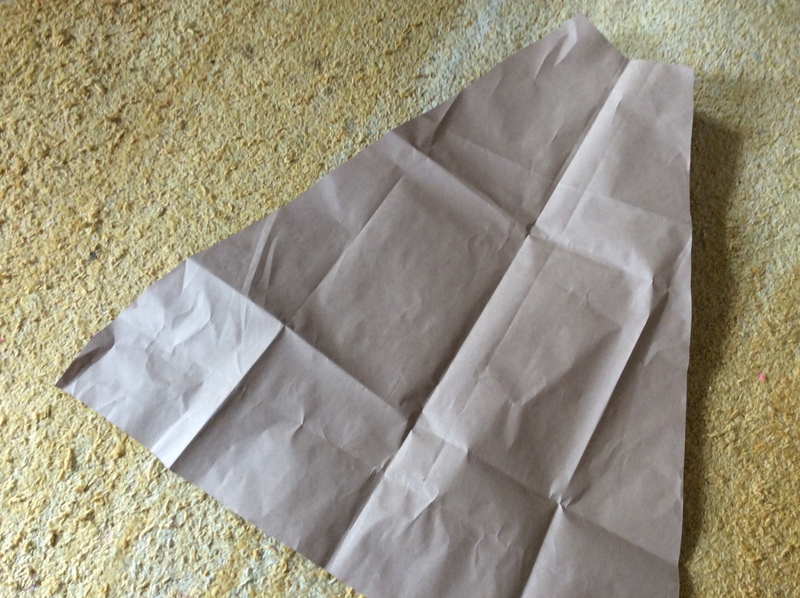 So I cut the fabric 1/4″ bigger than my pattern pieces, and ended up using the 3/8″ seam allowance. In other words I made the size 10. 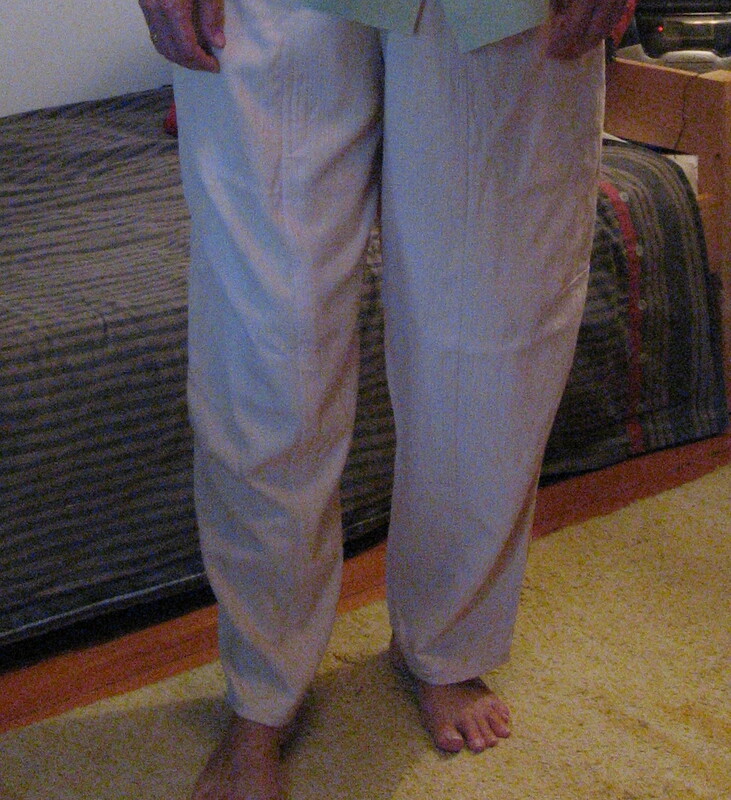 The pants actually fit pretty much perfectly in the front, and all the extra ease for the elastic waist is in the back. I like that. Also, I think these pants are made for women whose widest hip point is at the upper thigh. I couldn’t see it in the pattern, but the pants almost seem to pivot at the upper thigh. I do love it when I encounter a pattern made for my body. I added about an inch to the bottoms, and I’m glad I did because I needed the extra length for my long leg (it’s half an inch longer than the other, which is important when hemming pants). Given that Named says its models are 5’8″ tall, I’m guessing the pants are supposed to stop above the ankles. I prefer to have them at the ankles and roll them up if I want the shorter look. Has anybody else made an impulse pattern purchase purely because of seeing the clothing on another blogger? Clothes sure can look better on a real human being than on the pattern envelope can’t they? I wear elastic waist pants, and if I can slip a cord through the casing along with the elastic, well then I think I’m dressing young, not old. 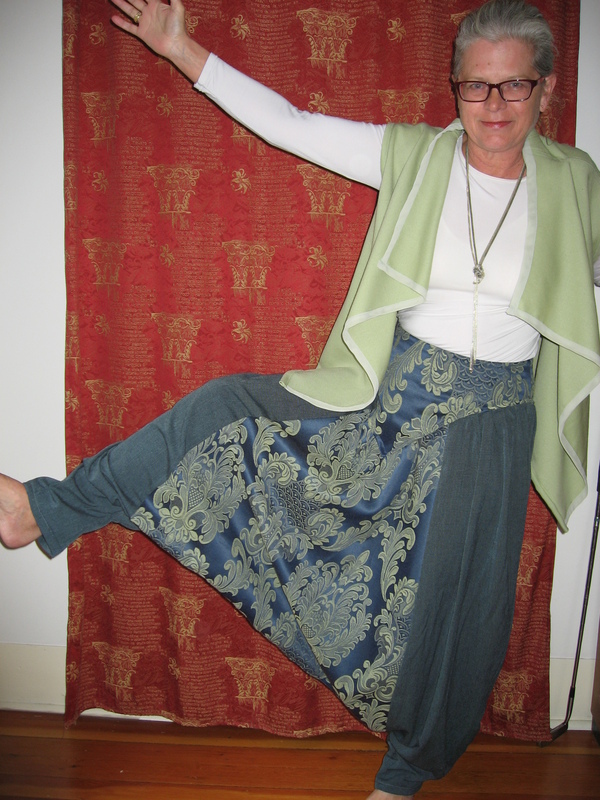 I found a pattern that’s actually labelled “young” and decided to buy it (on drastic sale) primarily to compare it with my own self-drafted yoga harem karate dance pants. It’s a cool Burda pattern for short pants. I used an exterior microfibre fabric from my stash, and experimented with putting longer legs on this thing. I took a page out of Marcy Tilton’s book actually, and tried two angled wedges, one in front and one in back to make the legs narrower than they would have been if I just followed the inner and outer legs lines. This is the front one. The back one is a little less angled, and longer, but without topstitching (I was running out of thread). I have to confess I have no idea how or why angled wedges work. But if anyone decides to try this at home, make sure your pants legs are a couple of inches too long before you start. They’re fun pants and super comfortable. More comfortable than the harem yoga pants, which give me trouble when I try to scramble into my truck. I plan to make another pair out of linen for the summer. Unfortunately I had to steal a lace from a hiking boot for this project. What will we do about that? 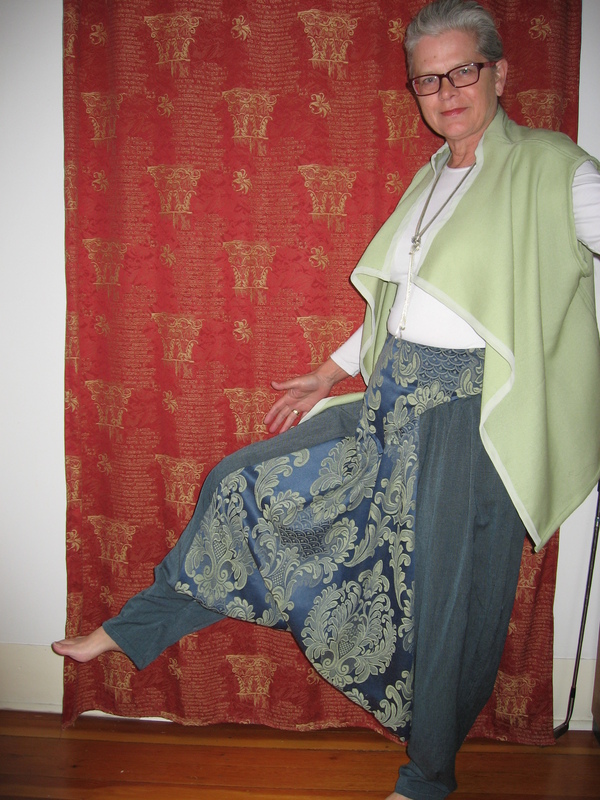 I was thinking of pants like this — I guess they’re called “harem pants”, but I don’t like that term — before I went wandering around Europe for a few months. I searched online and saw a few basic patterns, but nothing I trusted. I had done nothing except choose the fabric I wanted to use when it was time to go to Paris. Wandering toward the Eiffel Tower one day I saw a chic young woman wearing an intriguing outfit that included these sorts of pants in black and white, black boots and a black leather jacket. I stared. Then I stared even harder as I tried to figure out how her pants were constructed. She called me on it, shouting at me from across the street. For a minute I envisioned fisticuffs with a chi chi, feisty Parisienne. Not a good idea in a city where I didn’t know anyone who could carry me home, broken and bloody in the aftermath! Her angry comment to me — it was in French, but I got the drift — indicated she correctly surmised I was staring at her clothing, and not at her, so I really don’t understand why she was upset. Anybody? When I got back home, I pulled out the fabric I wanted to use as the base (it was material I’d bought at a theatre company sale). 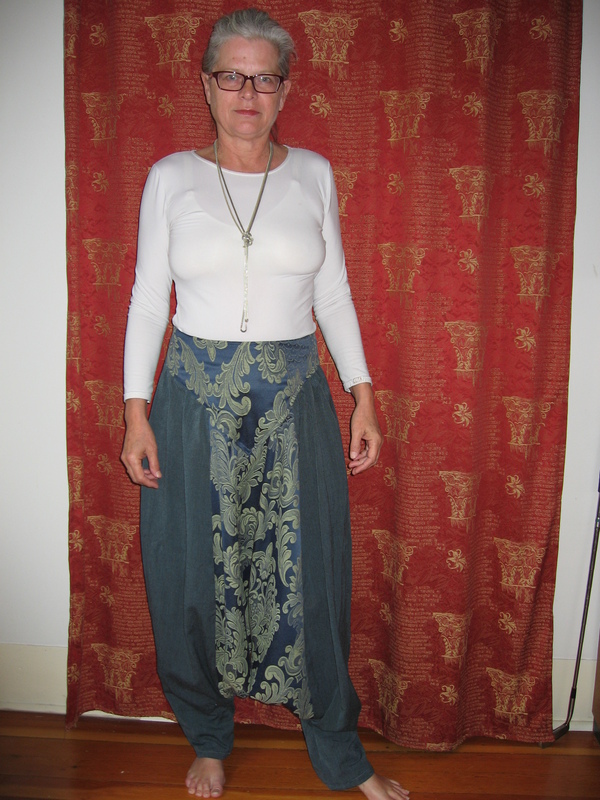 I used a basic drawstring loose pant pattern, and cut off the crotch points. Then I made pattern pieces for a central triangular panel for the front and back, as well as a dirndl waist, copied from an old skirt. I had already cut out pieces from the old skirt for the central panels when I went to a nearby yard sale and found the fabric that I actually used. I loved it, it was cheap, and it went with the base fabric better than what I was planning to use. So that’s it. 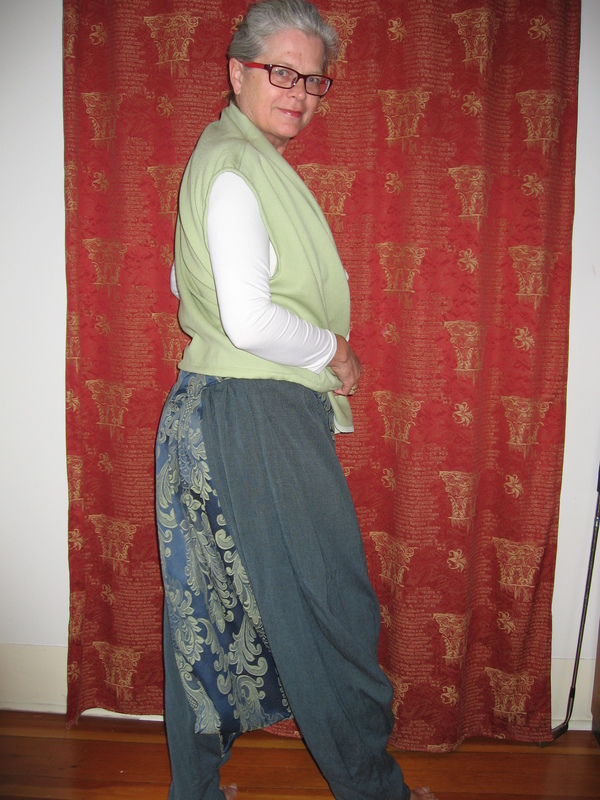 Some thing’s I’d do differently — I used a too-stiff non-woven interfacing in the dirndl waist. It was all I had in the house. I’ve since stocked up on various weights of woven interfacing, and next time I’ll use something lighter. Also, while I love the central fabric, it’s sufficiently stiff to make the pants a little more “formal” than I would like. 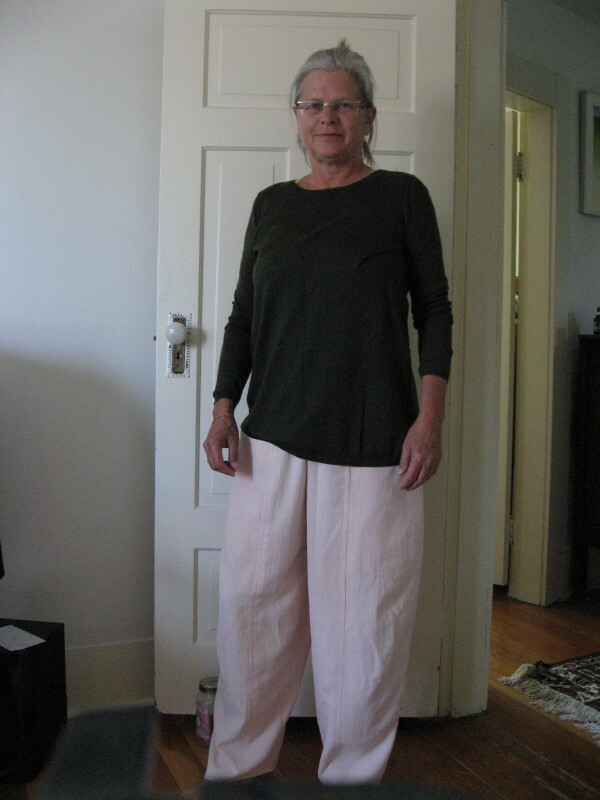 I will make these pants again in a lighter fabric, maybe linen, and I think they’ll look simpler and drape more softly. I would like to do piping when sewing two kinds of fabric together (many of the pants in the shop in Florence had piping). But I just don’t feel up to learning to make and install piping yet. Oh, and I’ve got enough of the yard sale fabric left to make a matching vest. That’s a project for some other time. And in case anybody’s wondering — the pale green vest is a copy of the Marcy Tilton pattern I used for the “web” vest. Her pattern is actually for a jacket, but I de-sleeved both versions. I got the fabric, a wool crepe, in a remainders bin for a dollar or two. I just love those sorts of finds.